The Lewes U3A Oral History Project created an archive of over two hundred recordings, which is a rich resource for historians who are interested in almost any aspect life in Lewes in the twentieth century. This little known archive is accessible to the general public at East Sussex Record Office and covers a wide range of topics such as: local shops and businesses, schools, churches, the races, clubs and societies. Joy Preston and Sarah Hitchings will introduce the project and the archive, play some extracts of the voices, and explain how to go about making use of the recordings for research. Full of the details of everyday life, as well as the way Lewes was touched by wider events such as the Second World War, this is history told and brought to life by those who experienced it. As usual the meeting will be held in the King’s Church Building, Brooks Road, and all are welcome. This postcard, showing the business Geoff Isted is researching, was mailed from Seaford to Belgium in 1920. There hardly looks room for South Street to have run along by the river bank when this was operating. 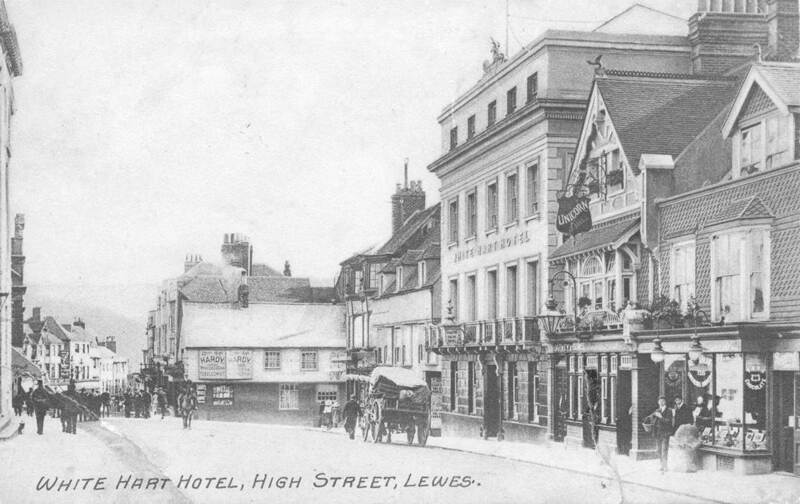 Towns have a range of functions, with those of Lewes over the years including fortress, seat of local government, regional social and cultural centre and commuter dormitory. However, amongst the principal roles of every market town is to be a centre of commerce for its hinterland – a market for surplus countryside produce, a source of those products that are not locally produced but must be imported and, for some products, a manufacturing centre. The prosperity of Lewes has been largely a function of its success, or lack of success, in these commercial roles, yet surprisingly little is known about the details. To underpin a full study of Lewes commerce, we should need to know much more than we do about the various local enterprises and the people who ran them. The town’s civic leadership over the centuries has, of course, been primarily composed of successful local businessmen and professionals. I hope that the Lewes History Group’s research projects will include such studies of individual businesses, or perhaps a small group of related businesses, such as the town’s printers, or auctioneers, or brewers. A few such projects are already underway, but we could do much more. How would one approach a study of a business? It does, of course, depend on the business, but there are a few common questions as a first step. When was it started, and who started it? Where in the town was it based? What records of its operations still survive? Are there still people with personal or family knowledge of the business? When did it close, and why? Is this something that might interest you? And are there local businesses, current or deceased, of which you have personal knowledge? If so, please do contact me. 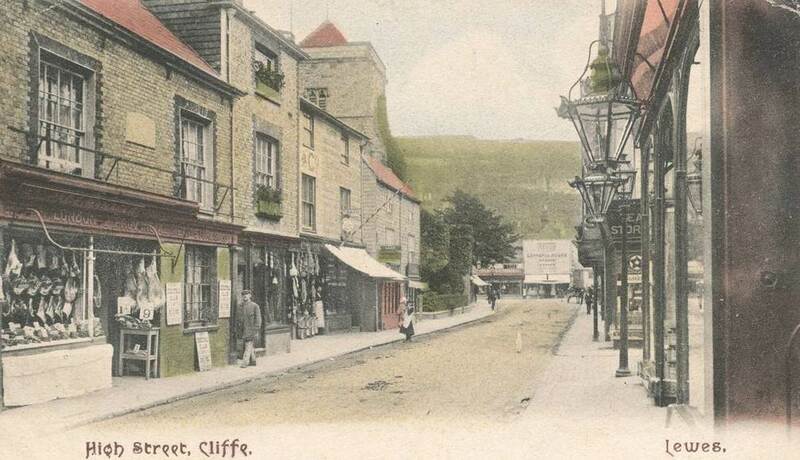 This Edwardian postcard of Cliffe High Street by the Mezzotint Company features an impressive range of retail businesses in Cliffe High Street. The London & Provincial Meat Stores in the foreground advertises its Christmas Club, while Commerce House dominates Cliffe Corner. Burwood Godlee, a prominent Quaker businessman, lived at Leighside, on what is now the Railway Land. David Hitchin’s book ‘Quakers in Lewes’ was first published in 1984, but I have only recently become aware of an updated second edition published almost a year ago, in August 2010. This new edition is updated and, most importantly for local historians, includes an index. David records that in the third month of 1655 (during Oliver Cromwell’s time) Thomas Robinson the elder came to settle in Lewes and attended a Seeker’s meeting held at John Russell’s house in Southover, a house identified by Colin Brent as ‘The Croft’ in Southover High Street. There he convinced at least three people of the truth of his message. They were the tailor Ambrose Galloway, his wife Elizabeth Galloway and Stephen Eager. Soon afterwards George Fox, regarded as pre-eminent amongst the Quaker pioneers, also visited Southover on a tour through Sussex, and the Lewes Meeting was quickly established. Even in the relative toleration of Cromwell’s rule, the Friends attracted negative attention, and carefully recorded the various verbal, physical and economic insults they received in their first few years in the town. They rejected ‘hireling priests’, and refused to attend the normal services they held in their ‘steeplehouses’ – the New Testament uses the word ‘church’ only to describe the people who followed Christ’s teaching, never buildings, and Quakers strictly followed this. They refused to pay their tithes. Although holding strict views on honesty and personal integrity, they followed a literal interpretation of Jesus’s teaching, and so refused to swear oaths, even the required oaths of allegiance to the state or in the legal proceedings in which they often became embroiled. Their evidence thus went unheard, and many languished in jail for long periods. Their defiance of social convention also did little to endear them to their fellow townsmen. They refused to use the names of the days of the week, or the months of the year, on the grounds that many were taken from the names of pagan gods. They used ‘you’ only in its formal plural sense, when referring to two or more people. They refused to doff their hats in respectful greeting, removing them only in prayer. They were strict pacifists, at a time when Englishmen were generally in the habit of settling minor arguments with their fists. Quakers also got into trouble for refusing to enlist in, or pay for, the Sussex militia. At first they met in private houses, but by 1675 the meeting acquired its own premises in Friars Walk, nearer to the High Street than the present Meeting House established in 1784. They maintained their distinctive manners and plain dress, and enforced strict discipline on members, but as time passed, and especially following the 1689 Act of Toleration, they became more accepted by the other citizens of Lewes. Several Quaker families became prominent in a range of businesses. One undoubted commercial asset was that their punctiliousness extended to their financial dealings – indeed any member unable to meet his financial obligations was expelled. The Rickmans, and their relative Burwood Godlee, were the most important Lewes Quaker family in the late 18th and 19th centuries. Burwood Godlee (1802-1882) brought gas to Lewes as a young man, and ran the company for 60 years. He was a director of the Lewes Baths Association, commissioner for the town sewers, a trustee of the Lower Ouse Navigation and chairman of the Lewes Savings Bank. He endowed the British School (for non-conformists) on Lancaster Street and the new town hospital and dispensary, and he led the Quaker meeting. In 1855 he became a magistrate, and for many years he was the only non-conformist on the county bench. Horses were sold in guineas, with bids rising in steps of half a guinea. The White Hart sold six geldings, five mares and a black pony. The geldings were named ‘Butcher’, ‘Alderton’, ‘Rodney’, ‘Croft’, ‘Doctor’ and ‘One-eye’. Counter-intuitively, the highest price was paid for ‘One-eye’, who sold for 14½ guineas, twice the price of the cheapest, ‘Alderton’. The top price was 22 guineas, paid for a 7 year old black mare, but three other mares were in the same price range as the geldings, and one poor bay mare attracted no bids at all. The pony sold for 13 guineas. This Edwardian postcard shows The White Hart and its neighbour The Unicorn on a busy shopping day around the turn of the century. Hardy’s tobacconists stands at the top of Station Street. 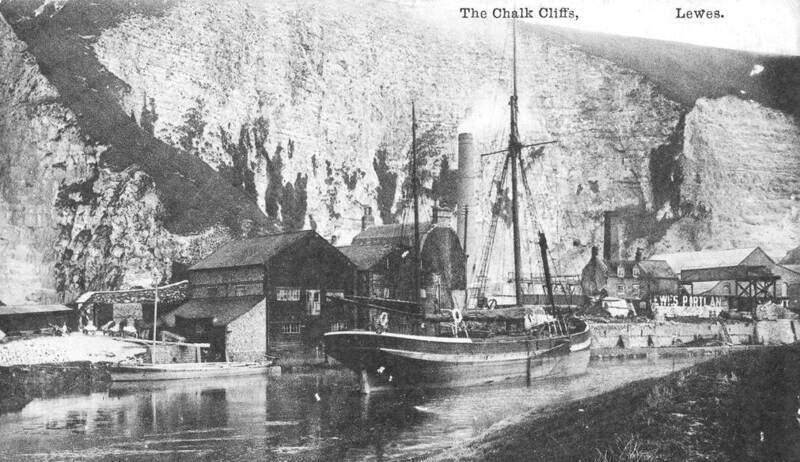 This entry was posted in Economic History, History of Religions, Lewes, Local History, Oral History and tagged Portland Cement Works, Quakers. Bookmark the permalink.